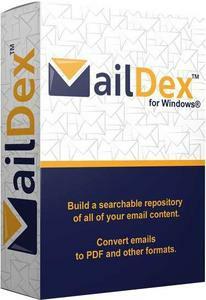 MailDex is a precision tool that is in active development. We provide several avenues for support, including telephone, live chat, online and email. Because MailDex is targeted specifically at a small set of demanding users who require reliability and acurate results, the MailDex team acts on user feedback when improving the product. Honestly, the email conversion software field is littered with junk products offered by anonymous people. We know that, and so we work hard to earn and retain your trust. MailDex has an advanced email rendering engine able to accurately display complex Microsoft Outlook messages, including Rich Text emails with embedded graphics and special formatting such as shapes, SmartArt and embedded charts. Hundreds of non-standard email formatting exceptions have been identified and individually included in the code, enabling our MailDex to render emails that other products can't. This means you get highly accurate images when converting email to image documents such as PDF. Reply and forward to email messages from MailDex using your default Windows email application, such as Thunderbird, Outlook, or any other email client that supports Simple Mapi. Requirements: MailDex requires Microsoft Windows (10/8/7).